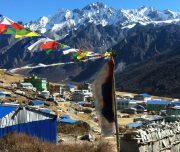 Langtang Valley Trek -12 days – Welcome to ABC Treks Pvt. 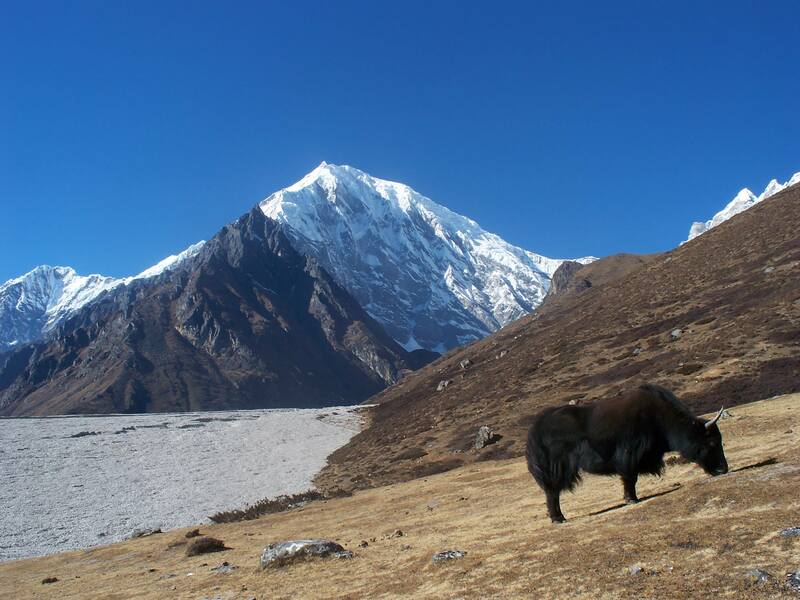 Ltd.
A journey to the Langtang valley has to be a highly gratifying of the short treks available anywhere in Nepal. The east-west running valley is the site of some eye-catching elevated panorama.To boot, its a notable place to meet distinctive people. About one week in minimum is essential. However,we advise trekkers to annex a few more days for adjustment and for side trips inside the valley. 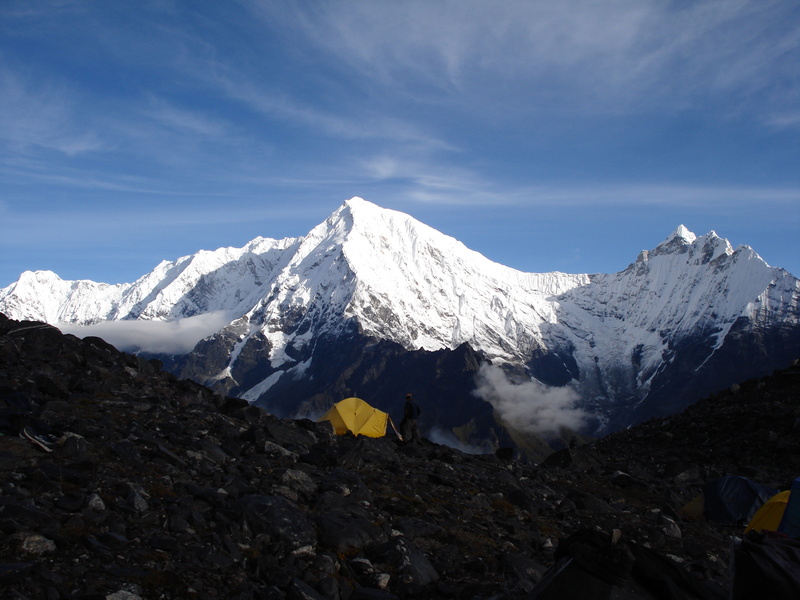 Throughout our journey, you will trek along the Langtang National Park. Although wildlife is not easy to spot in a forest setting, here you get the chance to see some captivating flora and fauna. Among those found in the park are monkeys, musk deer, Pika and the national bird of Nepal, the colorful Danphe,which is renowned as national bird if Nepal. The trek is best to start either from Dhunche or from Syabru Besi. Day 01 – Arrive in Kathmandu (1,400 m). Overnight stay at a Hotel. Day 02 – Guided tour in the Kathmandu Valley. Overnight stay at a Hotel. Day 03 – Drive to Syabru Besi (1,462 m) on a Public Bus – 8 hours. Overnight stay at a Guesthouse. Day 04 – Trek to Lama Hotel (2,500 m) – 5 hours. Overnight stay at a Guesthouse. 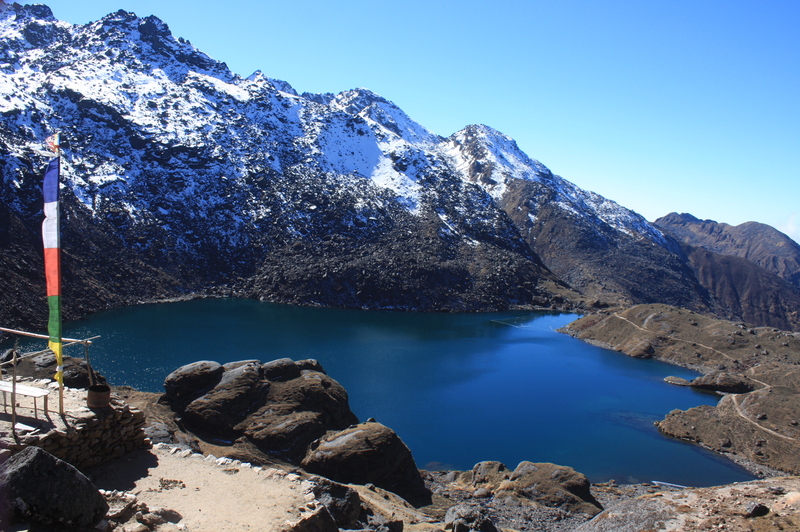 Day 05 – Trek to Langtang village (3,307 m) – 5 hours. Overnight stay at a Guesthouse. Day 06 – Trek to Kyanjin Gompa (3,798 m ) – 4 hours. Overnight stay at a Guesthouse. Day 07 – Kyanjin Gompa survey Day. Overnight stay at a Guesthouse. Day 08 – Trek Back to Lama Hotel (2,500 m) – 5.5 hours. Overnight stay at a Guesthouse. 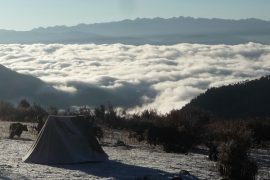 Day 09 – Trek to Syabru Bensi (1, 462 m) – 5 hours. Overnight stay at a Guesthouse. Day 10 – Drive Back to Kathmandu on a Public Bus – 8 hours. Overnight stay at a Hotel. Day 11 – Leisure Day and Farewell Dinner in Kathmandu. Overnight stay at a Hotel. Day 12 – Way to the International Airport for your Final Departure. Our airport agent will be receiving you at Tribhuwan International Airport, Kathmandu and s/he will be presenting the ABC trek signboard outside the airport terminal. You will be then taken to your respective hotel in our private tourist vehicle. Note: If you somehow arrive after 4 pm you will be informed about the trip by our guide, this will be the pre-tour meeting for you, so please make sure that you ask all the things you want to know. But if you arrive earlier than 4 pm, your pre-tour meeting will be held on that very day, but in our office. During the meeting, we will introduce your trek leader/guide. For the meeting, please make sure you bring your passport, three copies of passport-size photos and a readable copy of your travel insurance policy. In this meeting time, please make sure to clear the due balance, if any, and sign the legally binding trip form as well as the non-liability disclaimer. Overnight stay at a hotel. No meals included. Pashupatinath Temple is one of the most appreciable Hindu temples of Lord Shiva in the world which is located on the banks of the river Bagmati. However, you are not permitted to go inside the temple as it is strictly for Hindus only.Still, you can clearly see the temple and the activities held there from the eastern bank of the Bagmati River. There is a square two-tiered pagoda temple built on a single-tier plinth which is well knowned all over the world. Bouddhananath is one of the holiest Buddhist sites in Kathmandu. It was constructed in the 5th century with four pairs of eyes of Lord Buddha in four leading directions keeping an unfading watch over the people and their doings. You will see Buddhist pilgrims from Tibet visiting around the stupa spinning the prayer wheels. Bhaktapur Durbar Square, the Royal Residential Quarter of King Bhupatindra Malla,is a world heritage site as well.There lies a famous five-storied temple of Nyatapola in Pagoda style along with sacred Batsala temple, Bhairavnath temple, Duttatraya temple, Pujari Muth and Palace of 55 windows. Our remaining time in Kathmandu will be free for further exploration and we will be doing some shopping for our trekking essentials at last-minute in Thamel area. Overnight stay at a hotel. Breakfast included. We will be driving from Kathmandu to Syabru Besi early in the morning which takes about eight hours on a public bus. After driving through picturesque foothills from Syabru Besi to Dhunche, we’ll get a glimpse of Ganesh Himal along with the mighty view Trishuli River. Green hills and forests may make the drive very enjoyable. However, parts of the road may be bumpy and under construction. Overnight stay at a guesthouse. Breakfast, lunch and dinner included. We will first cross through the Bhote Koshi River and follow the Langtang Khola. This trail will ascend up to Bamboo (1,960 m) passing rugged paths. 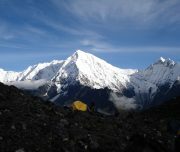 Afterwards, we will continue to climb up gently to Rimche (2,400 m). We can have lunch at this place and at the end of our trail is the Lama Hotel. While travelling through thus route we will be able to see red pandas, monkeys and bears if we are lucky. Our trek route will follow Gumanechok at Ghoda Tabela which literally means the Horse Stable. 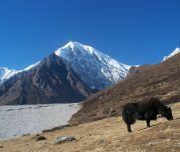 After this the trail we will be climbing gradually to the beautiful valley with yaks. 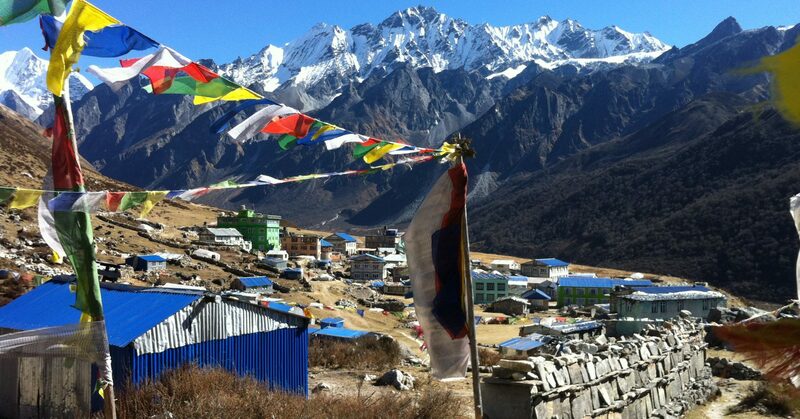 Langtang is a typical village and one of the oldest valley along this trekking route. The views of the mountains are astonishing and as we trek closer, the view becomes more imposing. It will be shorter walk compared to other days, but adequate for adapting. Some exciting things are there to explore, especially the famous cheese factory – don’t forget to try some locally produced cheese as fresh as it could get. This amazing valley is on the lap of the Langtang Lirung. This is the spot from where we will be able to explore the whole valley and then climb several small peaks (hillocks). This is a day for our rest as we traverse the area. 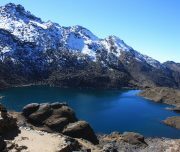 We can explore the monastery and the cheese factory and then walk up the moraine to see the eye-catching ice faces and tumbling glaciers of Langtang Lirung or we can go up towards Kyangjin Ri (4,350 m) which is the highest point of this trek located directly behind the village.Also from there, we can see the spectacular view of langtang peaks. We will head back to Lama Hotel. Keeping a keen view of the beautiful mountains in our memory, we will return back to the Sybru Besi where our trek started a week earlier. We will drive back to Kathmandu from Sybru Bensi after having breakfast. It will take about 8 hours on a public bus to reach there. In case you want to extend your trip, there are many options such as Chitwan jungle safari, river rafting adventure, mountain biking and plethora of activities. 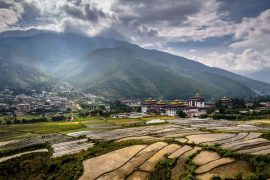 If you want to end your journey after this, we will have a farewell dinner party in a traditional Nepalese restaurant and enjoy cultural performances from different corners of Nepal. Overnight stay at a hotel. Breakfast and farewell dinner included. The trek ends here – For your flight departure, our airport representative will drop you to Kathmandu’s Tribhuwan International Airport and see you off. Hotel & Airport pick up and drop off services by a private tourist vehicle of ABC Trek Pvt.Ltd. Standard twin-sharing accommodation in a three-star hotel in Kathmandu including breakfast (4 nights only). Guided city tour in Kathmandu valley by a private tourist vehicle. All standard meals during the trek (Breakfast, lunch and dinner). Guesthouse accommodation during the trek in mostly twin-share and sometimes dormitory-style rooms. Local ABC Trek Pvt.Ltd licensed English-speaking trekking guide. The required number of local staffs and porters to carry your luggage during the trek (We assign one porter for every two guests). Food, living quartes, salary, insurance, equipment and medicine for all staffs. Down jacket and sleeping bag during your time in trek by ABC Trek Pvt.Ltd (which needs to be returned after the trek). Public bus transfer between Kathmandu and Syabru Besi. Free ABC Trek Pvt.Ltd duffel bag or kit bag along with sun hat (yours to keep). Sight seeing/Monument entrance fees in Kathmandu. Farewell dinner in a traditional Nepali restaurant with cultural performances. Lunch and dinner set in Kathmandu. Travel insurance which covers emergency high-altitude rescue and evacuation ( You can see the travel insurance page). International airfare and airport departure tax ( You can see the international flights page). Nepal entry visa; you can get access to the visa immediately after your arrive at Tribhuwan International Airport in Kathmandu (Tourist Visa with Multiple Entries for 15 days can be obtained by paying USD 25 or equivalent foreign currency. Also, Tourist Visa with Multiple Entries can be obtained for 30 days and 90 days by paying USD 40 and 100 respectively. we request you to bring 2 copies of passport size photos). Alcoholic beverages ,hot and cold drinks. Any others expenditures that are not mentioned in the Price Includes section.